As I have frankly stated before, my son made his school's top basketball team because of heart and hustle and not for his skills. I write this openly because my son is self aware. 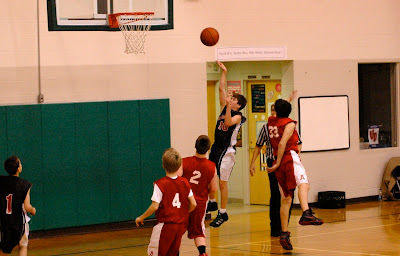 My son understands that basketball is a sport he will most likely not play competitively beyond 8th grade. He plays for fun. Regardless, like any other experience, this may help define who he is going to be. 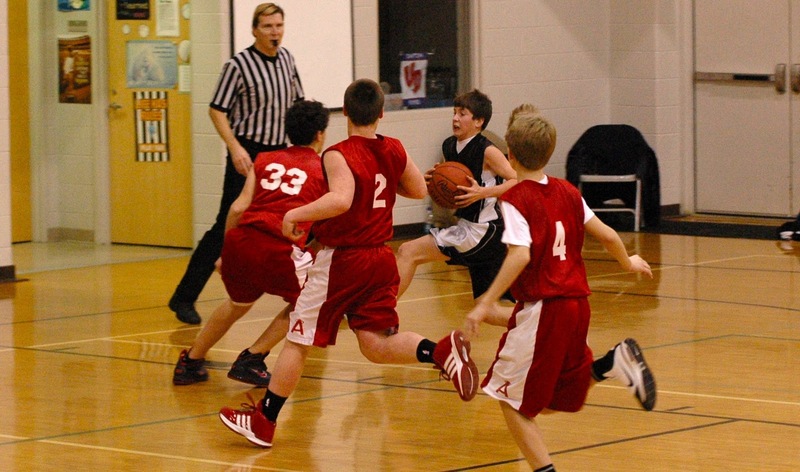 By the end of the 6th grade season last year, despite his lack of refined basketball skills or size, he worked his way onto the starting five of the A team. He was so proud. Hard work, heart and hustle combined with his speed and good coaching made him an outstanding defensive player. It was surely a character building year. As 7th grade basketball started, he knew that he would have to prove it all over again. His coach is demanding, many of the kids who specialize in basketball got better and many got much bigger. Nic has not had his growth spurt yet and quite frankly did not touch a basketball throughout the long baseball and golf seasons. Still he had confidence that he could out work his teammates and secure meaningful playing time. When the 7th grade season started, Nic was a bench player again. The team has struggled in the early going and a few of the starters are prone to foul trouble so minutes are not hard to come by. After blowout loss last week, the coach demoted four of the five starters and promoted four. My son was promoted. On the car ride home after the ugly game, my son told me that the coach gave a tough post game speech. He told me of the demotions and the praise he got for his hustle. He was especially proud that the coach called out his all out dive on the court for a loose ball. My son was beaming. I sat quietly and listened, but I knew that his situation was very different than last year's promotion. He had not technically earned a spot, the others simply lost their spots. I knew this was more about teaching the starters a lesson than rewarding my son. As he continued to talk, I was having a battle in my mind. Should I tell him my thoughts or should I just let him revel. I let him revel of a day or so, but then I shared my concerns with him before the next game. I told Nic that his hard work for a starting sport has just begun. He was a bit confused after all he was just named a starter. I told him that he will need to make every "starting" minute count if he wants to retain that spot. I told him that I think the coach is simply sending a message and the starters will likely be reinstated. If and when that happens I wanted him to know that he did not lose his spot. He told me that he thought that that was the case. I told him to take advantage of the situation. The next game he was on the floor for the tip off. The four demoted players were on the bench with the one kid who has yet to start a game all year. After one minute and fifty two seconds, the coach sends that one non-starter into the game to replace Nic. I could see the disappointment on Nic's face. As the first quarter came to an end with the new starters holding a 3 point lead, the coach turned to his demoted starters and said, "Have you learned your lesson yet?" The kids nodded rather sheepishly. They started the 2nd quarter, played very well and stayed out of foul trouble. As a result, Nic played less minutes than he has all year. I could have showered my son with compliments and told him how proud I was that he made the starting team again. But when the gig was up what would he think? 3) Do not give false praise to kids - they know exactly where they fit in - honesty is always best. 4) Praise and reward hard work and hustle. Basketball is a popular game around the world and kids are start playing basketball from their school days. Well, this is not essential that everyone loves to play basketball, most of the kids are playing basketball for fun and here from this article, we can get a better review of basketball journey and how students are loves to play it on big platforms. We should learn the basic techniques of basketball. Thanks for such a wonderful overview.